Bask in the beautiful scenery on the contoured Jameson Bench. 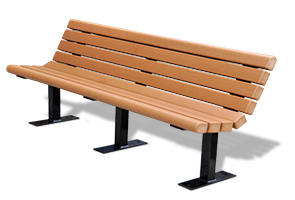 This recycled plastic Resinwood bench provides the familiar look of wood without the splinters and the maintenance. 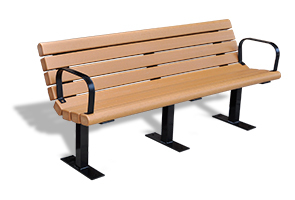 The bench is offered in popular lengths and is constructed with 3" x 4" Resinwood slats that are supported by a heavy duty steel powder coated frame. Both surface mount and in-ground mount frame styles are available. Add an extra level of comfort with the optional armrests.